Woodlands could get almost 10,000 new dwelling units as part of the Housing Board’s Remaking Our Heartland (ROH) programme, which is poised to transform the entire town into a “Star Destination of the North”. 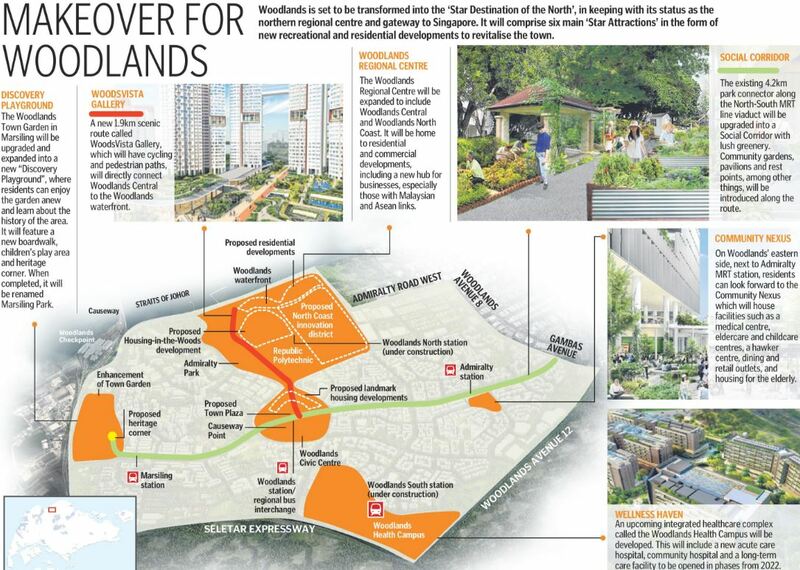 The Woodlands Central homes, to be integrated with commercial and community facilities, will be built near Woodlands MRT station. The authorities have yet to decide if these will be public or private units. That implies a 5 to 6 percent increase per annum and would mark a reversal from a long downtrend in home prices. The bank expected sales volume would surge this year, with the increases in transaction volumes to spur prices higher next year. The 99-year leasehold site in Upper Bukit Timah saw fierce bidding from developers looking to replenish their land banks. A 1.87ha residential site at Toh Tuck Road in Upper Bukit Timah attracted overwhelming interest from property developers, with a total of 24 bids submitted after the tender exercise closed on Tuesday (11 April), said the Urban Redevelopment Authority (URA). Malaysian developer S P Setia submitted the highest bid of $265 million for the plot, which works out to $939 psf per plot ratio (psf ppr).